PanARMENIAN.Net - The first-ever show in Turkey of artwork by the late Armenian filmmaker Sergei Parajanov illustrates both the challenges and necessity of cultural exchange across closed borders. More than 45,000 art lovers have visited the show since it opened in December at Istanbul’s Pera Museum, one of Turkey’s most important cultural institutions. It brought 76 works of art – including collages, storyboards, costumes, drawings and photographs – from the Sergei Parajanov Museum in Yerevan, making it the largest overseas exhibition of the museum’s collection, an article publised on Eurasianet.org reveals. The Pera introduces Turkey to Parajanov, a master of 20th century cinema who was also a prolific plastic artist. The show runs through March 17 to coincide with what would have been Parajanov’s 95th birthday in January. 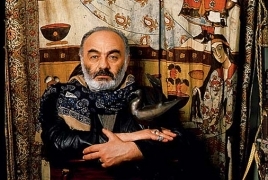 Called “Parajanov With Sarkis”, the show is actually a duo exhibition with one of Turkish contemporary art’s most important and original voices. At age 80, Sarkis, who is of Armenian descent, continues to create art in his Paris studio that explores themes of remembrance, displacement and identity, and he credits Parajanov as a seminal influence.